Wisdom teeth are the back molars found on each side of your upper and lower jaws.They are the last teeth to erupt in your mouth, which typically happens during the late teenage years or early twenties. Wisdom teeth often erupt through the gums without any symptoms, but sometimes the process can cause pain or tenderness — particularly if there isn't enough space for them in the mouth or if they grow at odd angles. If you feel your wisdom teeth coming in, then you may need to see a dentist to make sure there's no potential issue. If wisdom teeth fully erupt (come in) through the gums straight, well-spaced and positioned properly in relation to other teeth, then they often cause no pain or inflammation and don't need to be removed. It's only when they partially erupt, lack enough space, grow crooked and/or get infected that they become problematic and noticeable. Look out for gum or jaw pain. Even wisdom teeth that erupt normally through your gums can cause mild symptoms. Look for mild pain, a feeling of pressure, or dull throbbing in the gums near the opening of your throat or in the nearby jaw bone. Erupting teeth can irritate the sensitive tissues that make up your gums The pain will be more severe if the wisdom teeth are crowded and grow crookedly — they can cut into delicate gum tissues. Pain is subjective — mild pain for some, might be intolerable for others. The point is, some pain can be entirely normal for erupting wisdom teeth, so give it some time (at least a few days) before seeing your dentist. Eruption of wisdom teeth is not continuous, so every three to five months you may experience the same pain for a few days. 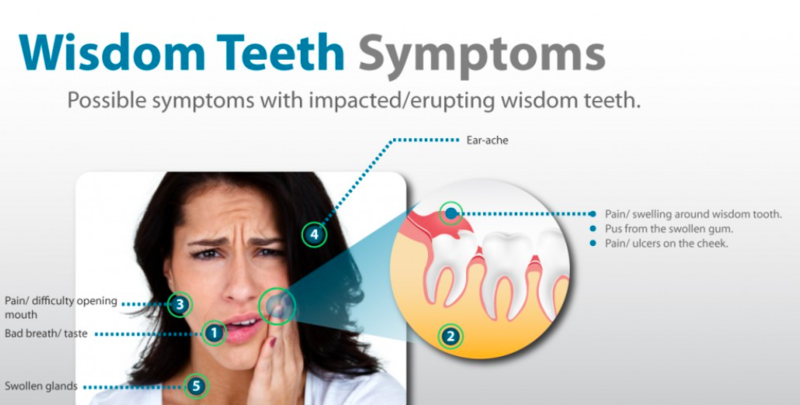 The wisdom tooth eruption influences the bone position of the other teeth so you may find that your teeth begin to shift. We can help you get back on track as soon as possible with your wisdom teeth problems. Give us a call or - BOOK ONLINE - For a consultation Today!